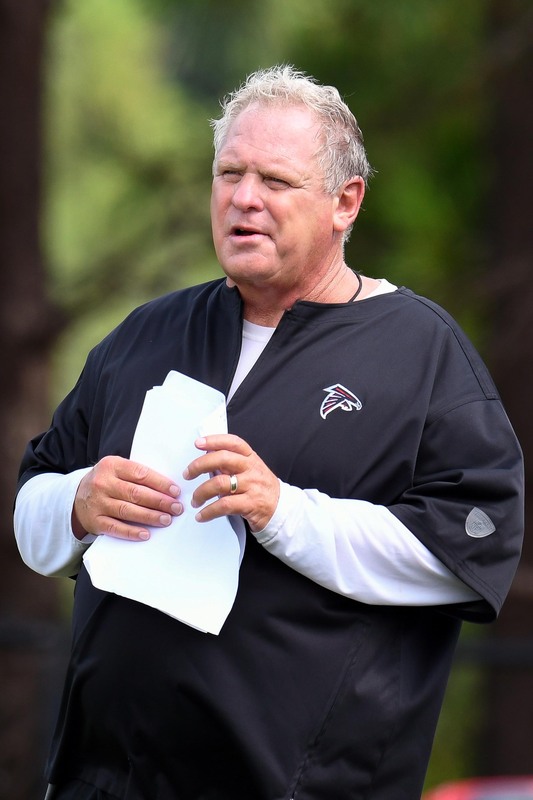 The Falcons have fired defensive coordinator Richard Smith and defensive line coach Bryan Cox, according to Alex Marvez of SiriusXM NFL Radio (Twitter link). Smith could eventually be re-assigned within the organization, sources tell Vaughn McClure of ESPN.com. Atlanta may look to fill the DC vacancy with an internal hire, per McClure, who identifies secondary coach Marquand Manuel as a “strong” contender for the job. Manuel, 37, doesn’t boast any play-calling experience, but did interview for the Jaguars’ coordinator gig last offseason. Other internal candidates to become the Falcons’ next coordinator could include pass game coordinator Jerome Henderson, linebackers coach Jeff Ulbrich, and receivers coach Raheem Morris, adds McClure. Henderson is on the 49ers’ radar, as well, as new head coach Kyle Shanahan reportedly wants to hire co-defensive coordinators. Smith, meanwhile, has coached NFL defenses since the late-1980s, and has coordinated units in Miami and Houston in addition to Atlanta. Since joining the Falcons in 2015, Smith never led a defense that finished among the top half of the league in DVOA, with the team’s best finish coming in 2015 (22nd). This past season, Atlanta ranked just 27th in defensive DVOA, although the club improved as the season progressed. As McClure hinted at, Smith may stay with the Falcons, but is currently exploring his options, tweets Ian Rapoport of NFL.com. Cox is also on the outs after Atlanta’s defensive line ranked in the middle of the pack in terms of sacks, but finished just 24th and 25th in adjusted sack rate and adjusted line yards, respectively. Although he deserves credit for helping second-year end Vic Beasley flourish (and lead the NFL with 15.5 sacks), Cox’s unit was subpar overall. Cox, who’s coached in the NFL since 2006 following a long playing a career, is now a coaching free agent. Given that Shanahan has left Atlanta, the Falcons will begin the 2017 campaign with new coordinators on each side of the ball. Steve Sarkasian has already been hired to replace Shanahan on offense, but the club also lost a respected offensive mind in quarterbacks coach Matt LaFleur, who was hired as the Rams’ new OC. As the Browns face potential sanctions from the NFL regarding a violation of the league’s electronic use policy, the Falcons are under investigation for pumping in artificial crowd noise at their home games, as we heard over the weekend. Owner Arthur Blank essentially acknowledged the team’s guilt during his meeting with the media yesterday, as ESPN.com details. Like the Browns, the Falcons face penalties that may include fines or the loss of a draft pick, and Blank confirmed that he expects to hear from the league regarding the matter within the next couple weeks. Linebacker Sean Weatherspoon, who missed the 2014 season with a ruptured Achilles, will be “an important part of building this defense and building this team,” Falcons GM Thomas Dimitroff said yesterday, according to D. Orlando Ledbetter of the Atlanta Journal Constitution. That’s a strong endorsement for a player who doesn’t yet have a contract for the 2015 season, and suggests Atlanta is serious about bringing Weatherspoon back. The Falcons received permission from the Seahawks to speak to Marquand Manuel, and will interview him Friday for their defensive backs coach job, according to Vaughn McClure of ESPN.com. McClure hears from a source that Seattle tried hard to keep Manuel, but it appears he’ll be joining former Seattle DC Dan Quinn in Atlanta — Josina Anderson of ESPN.com (TwitLonger link) says Manuel will be a senior defensive consultant for the Falcons, in addition to overseeing the secondary. A pair of former Washington coaches are also set to join Quinn’s staff. Pete Sampson of Irish Illustrated tweets that current Notre Dame QBs coach Matt LaFleur is expected to leave the Fighting Irish for the Falcons, while John Keim of ESPN.com says (via Twitter) that Atlanta will also likely hire Mike McDaniel in some capacity. LaFleur previously served as Washington’s QBs coach, while McDaniel was the club’s WRs coach. Alex Marvez of Fox Sports has even more details on new hirings for the Falcons, writing that the team has hired former Syracuse director of football operations Steve Scarnecchia (assistant to the head coach) and former UCLA defensive coordinator Jeff Ulbrich (LBs coach).